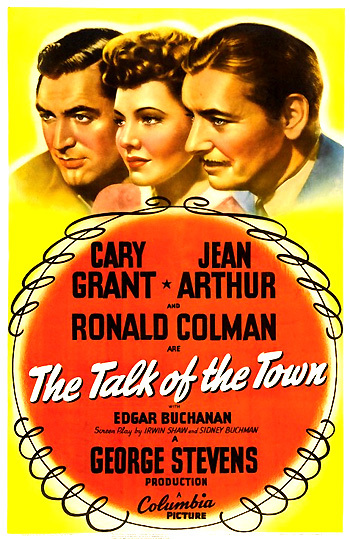 The Talk of the Town (1942) is a classic romantic comedy/drama of the 1940s from producer/director George Stevens and Columbia Pictures. This intelligent film about romance and justice, a blend of the serious and lighthearted, exemplified the trend toward 'social themed' films that arose in the 40s, in such films as How Green Was My Valley (1941), The Grapes of Wrath (1940), Mrs. Miniver (1942), The Lost Weekend (1945), and Gentleman's Agreement (1947). This was the third of three films that Cary Grant made with Stevens, following Gunga Din (1939), and Penny Serenade (1941) (for which Grant received his first of two Best Actor career nominations). The film was also a repeat of the pairing of Grant and Arthur from a few years earlier in Only Angels Have Wings (1939). In the same year as this film, Stevens also directed the classic comedy of the "battle of the sexes," Woman of the Year - a film noted for the first pairing of Katharine Hepburn and Spencer Tracy. And because this was Ronald Colman's first film made for Columbia Studios since his work in Lost Horizon (1937), the role propelled his career forward. In the same year, he also starred in Random Harvest (1942) and received his third Best Actor nomination (he lost the Oscar to James Cagney in Yankee Doodle Dandy (1942)). The far-fetched plot of the film, involving a romantic triangle and its complications between a wrongly-accused worker, a school-teacher, and a law professor, was honored with seven Academy Award nominations, but ended up Oscar-less: Best Picture (it lost to William Wyler's Mrs. Miniver), Best B/W Cinematography (Ted Tetzlaff), Best Editing (Otto Meyer), Best Score (Frederick Hollander), Best Original Story (Sidney Harmon), Best Screenplay (Sidney Buchman - who was blacklisted in the 50s, and novelist Irwin Shaw), and Best B/W Interior Decoration. The screenplay Oscar went to Stevens' other film Woman of the Year. Neither Cary Grant, Ronald Colman, Jean Arthur, or director George Stevens were nominated, although Colman was nominated as Best Actor for another film, Random Harvest. Stevens (his first Best Director nomination!) and Arthur would be nominated the following year for The More the Merrier (1943) - and Arthur made her final film appearance in Stevens' western classic Shane (1953). Nora: Leopold, as far as I know, you're capable of anything, even burning a factory. You were the wildest kid that ever went to a Locester school. Dilg: You wore pigtails then. I was in love with you. Amusing circumstances arise as she attempts to keep his presence a secret in the attic from the unsuspecting renter who arrives unexpectedly 24 hours early, due to the fault of his secretary. The tenant is a conservative, strict law-and-order, Dean of Commonwealth Law School and legal scholar, Professor Michael Lightcap (Ronald Colman), who is being considered for a Supreme Court appointment. The erudite professor hears Dilg snoring at night, and thinking it's Nora, remarks: "She must have adenoids." Nora is forced to identify Dilg as "Joseph," the gardener to the professor. In a classic scene, she drops the professor's egg breakfast on the newspaper's front page, where Dilg's picture is portrayed with the headline: "DILG ESCAPES TRAP!" Dilg and Lightcap become engaged in long arguments about the law. Dilg maintains that the law is "a gun pointed at someone's head" rather than being created with common sense for what people actually do. Although they disagree at first, Dilg is persuasive. The professor learns Dilg's real identity, but must be careful not to hurt his chances for appointment when he defends and reopens Dilg's case. His (Dilg's) only crime was that he had courage and spoke his mind...This is your law and your finest possession. It makes you free men in a free country. Why have you come here to destroy it? If you know what's good for you, take those weapons home and burn them - and then think. Think of this country and of the law that makes it what it is. Think of a world crying for this very law. Then maybe you'll understand why you ought to guard it, and why the law has got to be the personal concern of every citizen, to uphold it for your neighbor as well as for yourself. Violence against it is one mistake. Another mistake is for any man to look upon the law as just a set of principles. Just so much language printed on fine, heavy paper. Something he recites and then leans back and takes it for granted that justice is automatically being done. Both kinds of men are equally wrong. The law must be engraved in our hearts and practiced every minute, to the letter and spirit. It can't even exist unless we're willing to go down into the dust and blood and fight a battle every day of our lives to preserve it, for our neighbor as well as ourselves. The studio originally shot two different conclusions to the film -- one where Cary Grant gets the girl, and one where Ronald Colman wins Jean Arthur's affections. The film ends with both Dilg and Nora in Washington, to see Lightcap take his rightful place on the judicial bench. Although Nora winks at the judge, she races after Dilg for a film-ending embrace in the hallway of the US Supreme Court building.